Situated on a 5-acre farm in Langley’s Campbell Valley region, Festina Lente Estate Winery is Langley’s newest and most intriguing winery which opened it’s doors to the public in May 2017. The farm is owned and operated by Bill and Teresa Townsley who first established the environmentally forward homestead in 2010 and maintain a working apiary and orchard that provides the raw material for their clean and subtle wines. The product of three generations of winemaking experience in the Townsley family, each bottle of wine is proudly farm made in Langley, BC and is exclusively handcrafted in small batches of up to 40 cases. As beekeepers and winemakers, it was a natural fit for the Townsleys to explore the lost tradition of Mead or Honey Wines. 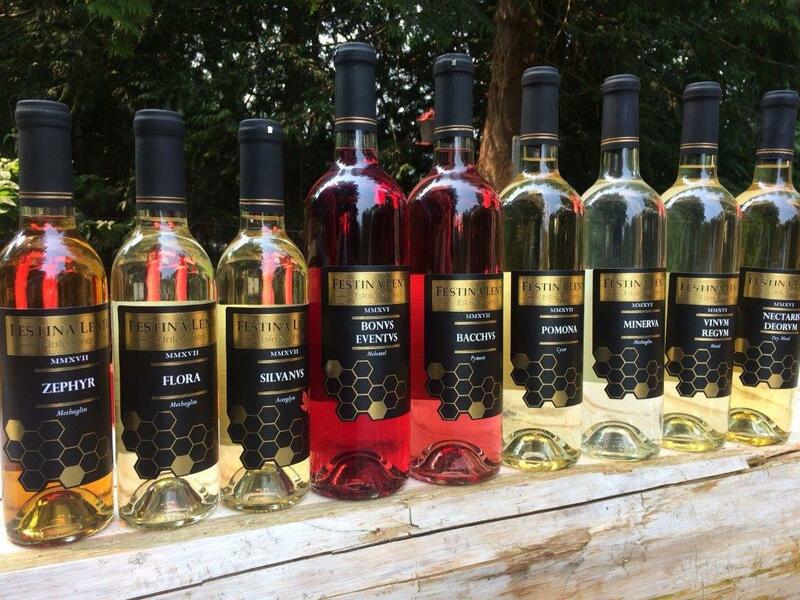 Of course, over the years, tastes change and they have developed a drier and more sophisticated honey wine that can be appreciated for many years. “Festina Lente” is Latin for “Make Haste Slowly” and accurately reflects the care and pride that they take in producing their sophisticated and timeless wines. Festina Lente wines are easy on the environment, fabulous with a gourmet meal and delightfully refreshing on their own. This winery is setting the standard for Modern Mead and it’s worth visiting their welcoming tasting room to sample the variety and breadth of their offerings that change on a seasonal basis. Come and see what the buzz is all about! Click Link here to see what they said! Hobby farmer and horse rescuer Teresa Townsley with her rescue horse Harry who came to her three years ago so malnourished he had lost his hair and only weighed 750 pounds. Townsley and the BC SPCA say the high cost of hay may lead to more cruelty complaints. Both are asking neighbours to help out neighbours in these difficult times. Townsley said it is much easier to feed a horse now than to rehab a malnourished one. The BC SPCA and some Langley horse owners are sounding the alarm about difficult times in the equine community as a result of skyrocketing hay prices. Last summer’s drought has led to a shortage of available local hay, with farmers and livestock owners having to buy outsourced bales at nearly double the cost. “I’ve heard of some people selling their horses and others not feeding their animals as much this winter,” said Langley hobby farmer and horse rescuer Teresa Townsley, owner of Festine Lente Farm. She is also a member of the Horse Council of B.C. Townsley said online forums have been lighting up with the concerns about feed costs. “The situation is really bad and going to get worse,” she said. A thoroughbread horse can eat a bale a day, she said. Marcie Moriarty, BC SPCA manager of animal cruelty investigations, said the agency has never before had as many horses in its care. “The availability and pricing of hay has been on our minds a lot lately. We know there are more cruelty investigations when this occurs,” said Moriarty. She said there is already equine winter starvation syndrome to be concerned with. “With colder temperatures, it takes horses more energy to maintain their body temperature, which means they are burning more calories so they actually need to eat more in winter. Moriarty said dealing with horse welfare in B.C. is a co-operative effort and only in extreme cases do they seize horses and recommend cruelty charges. But as with all rescue organizations, the SPCA is hoping that the horse community will help out neighbours in need. Townsley agrees with that sentiment. Townsley keeps one stall open for horses in need of help. She works with the veterinarian medical association to provide specialized care for extreme cases of animal abuse and neglect. She has kept Harry, who arrived at her barn three years ago so malnourished and badly treated that she estimates he was two days from death. The horse’s lower jaw didn’t develop properly because he was never given the opportunity to stretch it out to eat grass. This makes him harder to feed and has resulted in dental issues. It isn’t just horses that rely on hay; goats, alpacas, cows and sheep do as well. Townsley said this crisis should show everyone how important food security is and how important it is to keep agricultural land in Langley. “I live on 16 Avenue, near a lot of those beautiful rolling grass lawns people drive by. But what people don’t realize is those are actually meant for food. That grass is our hay fields. Kelly Coughlin with the Horse Council said hay prices have been increasing for years and it depends on who you talk to about whether there is a hay shortage or not. Otter Co-op feed wholesale manager Brad Hannah said there is a shortage of local grass, so it does become an issue of supply and demand. “Maybe a few stores have some, but not many. It’s going to be really slim pickings come March. “The first local cut of grass isn’t until June so it depends on how much you had stored over winter for availability,” he said. At Otter Co-op, they offer concentrates and grain-free feeds to complement the hay. Hannah also does hay analysis to make sure a horse is getting the right kind of hay, with the right balance of sugars and fibre. The BC SPCA said it encourages Langley residents to call or email them if they have concerns about a horse’s welfare. They also encourage people to view the horses they currently have up for adoption. “Horses add great value to people’s lives. We have some amazing horses looking for forever homes,” said Moriarty.